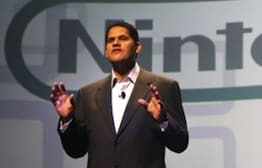 Reggie Fils-Aime has revealed in an interview with G4tv.com as to why the controller took centre stage with the reveal of the Wii U, rather than the console itself. Fils-Aime also confirmed that whilst Wii software would be compatible with the new Wii U system, it wouldn’t receive any graphical enhancement. I hope the competition can deliver unique experiences as well; if all they show is raw power, one might as well get a PC. I hope they make this $300 and the games $50-$60. Some new form of Wii Sports and Play for U.
I can see how some one could be disappointed that VC games I get on my Wii, won’t be HD and with the Wii games. However, it would be interesting to see Skyward Sword get that HD ability? I’m probably going to get his system regardless, I like the controller a lot! It’s like what the Dreamcast should have been. It’ll be interesting to see what the Wii U has in store, I am very excited in what Nintendo has in store for us. I wish they’ll announce connectivity with the 3DS in someway.